David recently suffered a life-changing spinal cord injury from an ATV accident. His C4 and C6-T1 vertebrae were fractured and his spinal cord was compressed. He is now a quadriplegic. He has begun rehab in Madison, WI and is already making great progress. However, as you can imagine, the care he needs is very expensive, which is why we need your help. 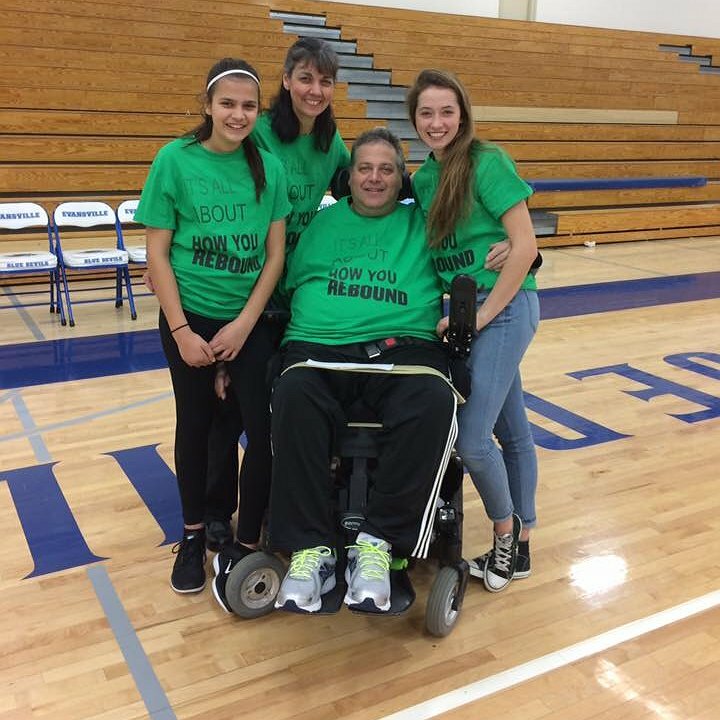 Before the accident, David was always heavily involved in sports, whether it be coaching his daughters’ basketball teams or supporting his community’s athletics. He ran his financial office helping to advise others. He was part of the local Kiwanis organization. After 6 weeks in the hospital and the rehabilitation center, David has returned home. David still has a long road ahead of him, but with our family’s support system, he will make it through. We are in the process of conducting home renovations in order to make it wheelchair accessible. Additional expenses that we also face include the purchase of an accessible van, in-home care, medical equipment, and additional features on his wheelchair. These present a financial challenge that our family cannot meet alone. To help with the financial burden of David’s uninsured expenses, a fundraising campaign in his honor has been established with Help Hope Live, a trusted nonprofit organization that has been providing community-based fundraising guidance to patients and their families for more than 30 years. All donations are tax deductible to the full extent allowed by law, are held by Help Hope Live in the North-Central Spinal Cord Injury Fund, and are administered by Help Hope Live for injury-related expenses only.To make a tax-deductible donation to this fundraising campaign, click on the Donate Now button. We are so grateful for all of the support and prayers that our friends and family members share with us. David is presently in Omaha, NE at QLI receiving some great PT and OT. The people there are outstanding and helping him to achieve some vertical status which he has not had much of yet. This should lead him to being able to be upright for part of everyday. Eventually he may be able to have a wheelchair that could stand him up someday. He is also working harder at getting stronger by lifting weights and strengthening that core strength. David is a student at UW-Madison. Well not actually but he has a student ID and is attending Adaptive Fitness Classes on Fridays at UW. He also went in yesterday for driver evaluation. We will be having to take him for more driving lessons and getting the vehicle adapted for him. His goal is to drive by his birthday in March. He has gained much strength back in his right shoulder and arm which were injured while he was at the rehab center. So that is great. We were able to put in an asphalt pathway in the yard for him to get around easier at home. We also had an automatic door put in on the house so he has a remote to control that and the garage door. So things have definitely progressed in one year!!! Oh yes…his FES exercise bike is a blessing. When he is hooked up to that it is great to see the smile on his face when he sees his own legs moving with the motor and electrical stimulation!! Thanks everyone for your help to achieve these items. Without you all of this would not have been possible!!! David has started his therapy at St. Marys Dean in Janesville. He is working on healing a pressure sore on his left achilles area. The new wheelchair is working out pretty good. There is a new apparatus in the van that he drives up into and it locks his wheelchair in so that we do not have to strap him in anymore. He has survived his first cold…ugh! There will be a benefit dinner, auction Saturday June 10th in Evansville with a band and we would love to see everyone!! It runs from 5-?pm It will be at the Red Barn. There will also be a raffle. David has received his own wheelchair this week. He has a pressure sore on his left Achilles area that we are taking care of at this time. Phone calls and visits are welcome here at our home. Last friday was the 12 week mark!! David is going to acupuncture today. We are going to start PT outpatient and looking to do OT outpatient also. If some of you are available during the day to take him to appointments during the day that would be awesome since I started back to work last week. Our homecare people have been great! David loves to get out too…can’t wait for warmer weather!! Give him a call in the afternoons, he loves it!! So we have been home for about one month. David has been attending Maria’s practices and helping coach tournaments on the weekends. He had a cortisone shot in his right shoulder ball and socket joint about a week ago. Today he felt me touching behind his right knee! Yippee!! We also started acupuncture last week and we will try it again tomorrow. I am going to try to go back to work next week. David believes that each of us should return to our “jobs”. He is unsure of his return as of yet. Two wonderful women have been hired to help out in the morning to get David ready for each day. One other RN is coming in to help mid day and then I will be home for the rest of the day. It would be great if insurance understood that this was a medical necessity…since he is not independent but they do not…It seems like we are always trying to justify something – medical equipment, therapy, doctor appointments, tests, etc. Heather went back to UW yesterday. She was a great help to all of us. This has definitely made us stronger as a family unit in ways we never imagined. Our family and faith has grown stronger! Thank you for all of the continued support, cards, etc. HI Everyone Yes we have been home for almost two weeks. David is happier home. Here are a few adjustments at home: he has a revamped bedroom with a hospital bed (with a special mattress to help with pressure relief to prevent pressure sores from developing), cough assist machine ( since he can only breathe using his diaphragm), and a hoyer lift to help move him from his power wheelchair to bed or to his shower/commode chair. During the day, David is more sensitive to temperatures than he use to be. If someone stops to visit he will be wrapped in a blanket and wearing a hat because he is cold even though the rest of us are rather warm. This is common for SCI (spinal cord injury) people. Visitors are welcome but please do not come if you have any illness because David cannot fight off respiratory infections easily with limited breathing capabilities. 1.the new zero entry bathroom, so that I can wheel him into the shower and do other necessary hygiene duties 2. the hardwood floor in the bedroom so that he can maneuver his wheelchair in the room. 3. the final painting over the new widened entry ways. WOW how far we have come in a few short weeks. Thanks to all the contractors, friends, and neighbors. We are waiting for the hospital bed, respiratory therapy machines, the lift apparatus and bathroom chair to arrive. Then David can safely come home as soon as next week. Hi Everyone!! David is feeling much better! Some of the girls from his BB team stopped by to visit him yesterday after their tournament. He will have a home visit on Wednesday this week to see if we are getting close to having him home next week…WOW. Where has the time gone. He is making tremendous strides. We are now searching for at home care, a van, and finishing up renovations. Staying strong and keeping the faith!! Thanks for joining us on our new page!! We are hopeful that David’s fever will be under control. We are asking for a couple of days of rest. Our house should have the ramp in place in the garage. All doorways have been widened. The workers are had at work on the bathroom 0 entry shower, etc. New floor in the bedroom. We are searching for help with care when he comes home…All things take time and patience. Thanks to all of you for being there for us! He will be our Christmas gift!! We have decided to start a fundraising page with HelpHOPELive to cover any costs medical costs for David. We are going to continue posting on CaringBridge to keep you all updated! We just made a donation - THANKS Pat Nagle! BOOM! Hi Dave & Penny! We are glad that David is back home. It's a long road, but it sounds like you are making quick progress with the home remodeling, etc. You are in our daily prayers for continued progress and to get the funding you need. I know how expensive all of this will be, but have faith in your family and friends. We will help you get there! Dear David, You and your family have been in my prayers . You can do this with God's help family and friends , be patient with yourself. Hi Dave and family! We are thinking of you and sending positive thoughts and prayers your way. We are glad to hear you are making progress! If you haven't found a van yet, here is a site to check out, they are located in McFarland. www.aandjmobility.com Chris has worked on some of the vehicles they adapted for customers. Thanks, Penny and girls, for the updates. Keep up the positive spirit! Dave, sorry to hear about your accident. Hope things are improving for you. Glad to hear you are maybe getting home soon. If there is anyway I can help out with, just let me know. Thinking about you and your family. Hi David, Prayers for you and your family, just found this website, nice to see your picture,looking good! Be positive and know we are all sending you the strength you need. Dave, Never give up! That smile says it all, it tells me you will keep fighting and will keep working hard on recovery! Sending you positive vibes! Hi Dave. So very sorry to hear about your accident. So glad that you will be able to come home soon. We will be keeping you in our prayers. Stay positive. Dave--keep up the fight. You are in our prayers each day. Penny--take care of yourself, too. Your family is loved. Praying for you, Dave, and thanking our Lord for the blessing of your loving family. All of us in the Quamme family are here to help. Janesville is pretty lonely for the one and only "Cat-Man"! Oh David, I am so sorry to hear of your accident. My heart hurts out here in Idaho & I wish there were something I could do. The most effective thing I can do is pray & ask that God give you the strength that can only come from Him. You are such a strong man & one of the kindest I have ever met. It was such a pleasure to work with you all those years ago. Keep smiling & keep that faith. So good to see your smiling face in this picture. Keep working hard so I can harass you soon! Best wishes from me and my family. Hey Dave just heard about your accident, so sorry but try to stay positive! Those doctors and therapists can do so much these days. We will keep you in our prayers. Keep up the good good work Dave. We will keep praying for you and your family. Keep that smile going Dave and work hard. You've got this. Prayer and thoughts of you daily. Hoping that your visit home becomes a permanent stay in the near future. Greg and I have been praying and thinking of you and your family. Thinking of you all and sending good thoughts your way! Keep up the fight. Sending prayers. So very excited that you are talking of going home! Keep up the progress David and we will keep praying! Stay strong! Thoughts and prayers sent to you and your family.